New Severstal goalie Julius Hudacek has played in the KHL before – but only for one game. 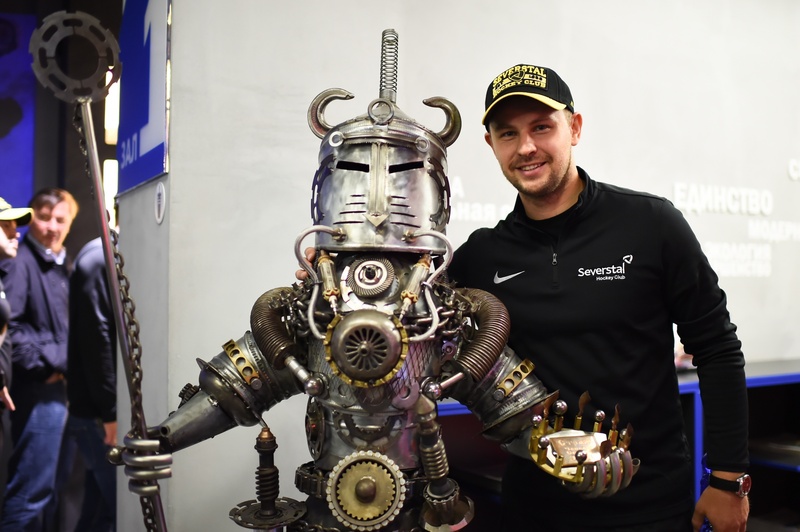 In an exclusive interview for KHL.ru, the Slovak international told Sergei Vinogradov why he was determined to come back to Russia, how he hopes to get to the Olympics … and why his next post game show might be inspired by the Cherepovets Steelworks. Coming to Severstal is a return to the KHL for you. Didn’t your time at Sibir put you off coming back? I was in Novosibirsk four years ago. I really like the team and the city, but for one reason or another I only ever played one game for Sibir. After that, it all finished. I don’t really know what happened. Since then I’ve played three years in Sweden. My game got better there, and I achieve everything that I could. That’s when I realized I needed a new challenge. I told me agent I wanted to go to Russia. Three or four KHL teams were interested in me, and I chose Severstal. Why? I’d heard that the other Czech and Slovak players who came here did really well. Hopefully I can continue that tradition. I’m heading to the best league in Europe so I can have the best chance of going to the Olympics. That’s always been a dream for me. You’ve played in several European leagues. Would you agree that right now the KHL is the best tournament in Europe? Yes, I don’t think there’s any doubt about that. Teams in the KHL have the financial strength to recruit top-class players. I’ve played in some great leagues in Europe, but the KHL is the best. Which players in the KHL do you know? Are there any who you are worried about facing? No, I’m not afraid of anyone. I respect them all, but I’m not frightened. There are lots of good forwards playing in the KHL, at CSKA, Lokomotiv and all over. Playing at the World Championship for Slovakia, I’ve come up against Russia a few times and had the chance to experience their skills and talent. Who stood out? Panarin and Shipachyov, for example, who both came from Cherepovets. I know that they’re now in the NHL, but they played in the KHL for many years. It’s going to be interesting to compare Panarin, Shipachyov and the other stars of Russia’s national team with the guys who are in the KHL right now. How did your first practices with Severstal go? Compared with the other teams I’ve played on, things here have been a bit gentler to start with. At Sibir, for example, that had us working at full intensity from day one, and that was tough. Here, we’ve gone step-by-step. First, I did the medical examination, then we had some simple exercise on the football field and in the gym. When we get to our camp in Leningrad Region, that’s when we’ll start the real hard work. Has anything surprised you in practice? I wouldn’t say ‘surprised’, but I’ve been pleased with my relationship with our goalie coach, Dmitry Khomutov. He’s a real professional. Jakub Kovar, who played here last season, told me about him. That’s really important for me, and that was one of the reasons why I chose Severstal. I’m 28 years old, but I’m sure that there are still opportunities to learn and develop my game. 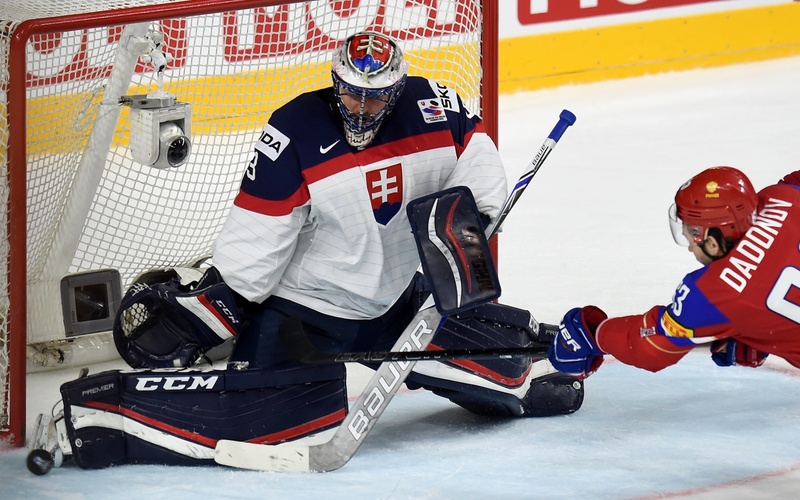 Several Slovak and Czech goalies have done well in the KHL, and in particular at Severstal. In recent years, we’ve seen Rastislav Stana, Jakub Stepanek and Jakub Kovar here. Why do you think so many Czech and Slovak netminders do well in Russian hockey? I think that Czech and Slovak hockey has a lot in common with Russian. If you look at the Finns and the Swedes, there’s a much bigger difference. Maybe that’s why Finns and Swedes find it harder to adapt here, whereas its easier and more comfortable for us. There are a few Czech and Slovak goalies in the KHL at the moment and I hope that for me, Severstal will work out better than Sibir. How highly regarded is the KHL among the coaches of Team Slovakia? Do you think that playing in Russia will help you get more international opportunities? Yes, of course. Right before the Olympics, I’m heading to the best league in Europe so I can have the best chance of going to the Games. That’s one of the biggest reasons why I wanted to come to the KHL. If I do well here, there’s a real chance I’ll get to go to the Olympics and for me, that’s always been the dream. The ‘Huda-Show’ was improvised, but by the time I moved to Sweden people started to expect it, so I had to start preparing my routines. Fans in Slovakia and Sweden really loved your ‘Huda- Show’ after your games. Thanks to the internet, this has become famous all over the world. Do you plan these in advance, or is it spontaneous? The ‘Huda-Show’ started back in Slovakia when I played for Kosice. I was still very young. They had a goalie who put on a bit of a show after the games. One time, after the game, that goalie had done his little routine and headed for the locker room. But the fans weren’t going anywhere, they wanted more. That’s when someone suggested maybe I could have a go. And I did. At first, it was improvised, but by the time I moved to Sweden the ‘Huda-Show’ already had some fans on social media, and people started to expect it. That’s when I started preparing my routines. Several of them had a theme, usually chosen by the sponsors. On Christmas Eve one year I dressed up as Santa Claus. The kids loved that! Have you brought any props with you to Cherepovets? [Laughs]. No. Maybe I’ll find something in the Steelworks and I can use that in the show. Previously you’ve played in fairly small countries, but Russia is huge. Are you ready for some long flights? Yeah, I’m sure that won’t be a problem. In Sweden, we also had a lot of travelling, seven or eight hours on the road was normal. The only difference is that we went by bus and here we’ll be flying, but I don’t think that’s such a big difference. Also, here in Cherepovets we’ve got a good location. The guys at Amur and Admiral have to fly from one end of the country to another far more often. How are you getting on with learning Russian? I started taking Russian classes after the World Championship. Apart from that, my wife and I also studied some Russian in Slovakia. Our Slovak language is quite similar and I reckon I won’t have too many problems. I’m sure that now I’m living here I’ll pick up Russia fast. Give me two or three months, and I hope I’ll be speaking fine. I don’t think I’ll take up fishing, it’s a bit boring. You’ve talked about being a big golf lover, but in Russia most hockey players like to go fishing. Will you be joining them? I don’t think so. For me, it’s a bit boring. As for golf, it’s a really good way to relax, to switch off from everything else. Apart from golf, I also like playing tennis, football and basketball. A few days ago, you showed off your new helmet. It’s got a picture of an animal in some kind of hat. Who is that? Didn’t you recognize him? It’s an elk. I thought there were lots of them in Russia. There’s a famous fairy tale about an unfortunate elk, and bad things are always happening to him. But back in Sweden I asked to have one on my helmet and then I had one of my best seasons. Since then, he’s been my lucky mascot and I wanted him on my new helmet. Career: 2004-07, Spisska Nova Ves; 2007-08, VSR 20; 2008-2011, Kosice; 2011-2012, Sodertalje; 2012-13, Frolunda; 2013, Sibir; 2013-14, Pardubice; 2014-17, Orebro. Honors: Slovak Champion 2009, 2010, 2011. World Championship silver medal 2012.